The quality of Joy mentioned here is far more than superficial happiness. It draws so deeply from the power of the Holy Spirit that even physical suffering cannot steal it away. The world offers counterfeit joy, a fleeting form of superficial happiness. It offers no solutions, only a temporary masking of the pain. Your living witness to the power of the Holy Spirit may be the one thing necessary to help your friends find eternal solutions. Time is short. Live like their tomorrow depends upon you! In Greek, the word for joy is chara. It means spiritual gladness from a right relationship with God. Do you have spiritual gladness? The "Tip Clip" is simply a clothespin used to jog your memory. 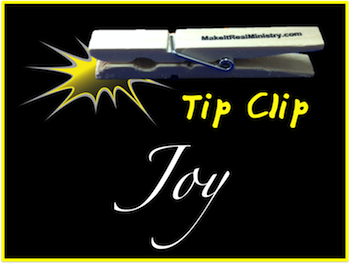 Place your "Tip Clip" in a spot that will give you daily reminders to work on the Holy Spirit characteristic of Joy. (Examples: Carry it in your pocket, attach it to the computer monitor, or hook it to your favorite coffee mug.) Use the tips below to help you grow in this area. Tip: Make it your mission to promote spiritual gladness. Share a Christian joke or a humorous quote every day to as many people as you can. Below are a few suggestions to help you get started. Remember, the purpose is to bring spiritual gladness. Show the world your wholesome joy in the Spirit and be prepared for the many doors He will open so that you can go even further. Preacher's graveside remarks: "This is not Joe, this is just the body. Joe is now in Heaven. This is just the wrapping, the gift is gone; this is just the shell, the nut has left us." While looking through his pictures at the one hour photo shop, the man became very displeased. "These pictures don't do me justice!" he exclaimed. The man behind the counter glanced at the photos then responded, "Sir, you don't need justice, you need mercy." During Sunday school class, the little boy was especially captivated by the way God took a rib and created woman. Coming in from play later that afternoon, his parents asked why he was out of breath and holding his side. "Not sure," said the little guy, "but I think I might be having a wife!" Back to Top of "Joy: Characteristic of the Holy Spirit"